This post is a beginner’s user manual for a travel trailer. I purchased a travel trailer a year ago and have learned a lot of things that most of the more experienced people never explained to me, so I’m hoping that his post will steer you in the right direction. Before you commit to purchasing a travel trailer yourself, we recommend doing a test run to make sure it’s right for you. You can find tons of cool camping trailers on Outdoorsy, for a great price too! You can see your local inventory by clicking here. Our family (especially our two boys) were SO excited to head out on our first camping trip. We bought our Rockwood 25′ travel trailer from Camping World (horrible choice of store, by the way) and were ready to hit the road. On our first trip, we forgot TONS of essential items that would have made the trip nicer. I kept a list of all the things we forgot and had to buy for our new trailer that’s definitely worth checking out. I definitely recommend buying a separate one of each item instead of just grabbing it from the house, or else you’ll have to remember to pack it each time. 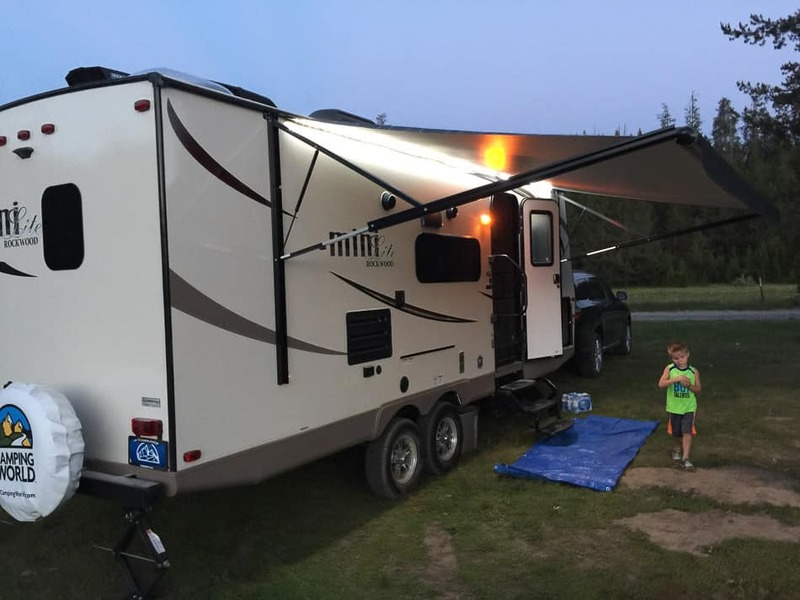 One of the biggest benefits of a trailer is that you can leave all your camping gear packed, so you’re ready to go camping on a moment’s notice. While there are many new things to buy, don’t overload your trailer. It’s no fun–especially in a smaller trailer–to have the isles and every inch of the ground in the trailer cluttered with things. Park the trailer out in front of your house for two or three days before your first trip and take the time to organize things into a permanent spot as you load. We took a label maker and labeled what goes on each shelf and in each cabinet before putting anything in, and it was really helpful. Plan meals with as many non-perishable foods as possible. Bring canned foods, dry rice and beans, dried soups, oatmeal, etc. That way, when your trip is over, you can just bring your dirty clothes inside to be washed and leave everything–even the food–in the trailer for the next trip. Your travel trailer has three different tanks of water: black (used toilet water and deposits), gray (used water from sinks), and fresh (drinkable). When you load your RV, you need to fill the fresh tank full of water using a hose at your house. Your black and gray tanks will be empty as you begin your trip and then you’ll dump all your liquids on the way home. For our first few trips we filled up the fresh water at home with a hose and then drove up–full of water–to the camping area. We later learned there was an RV dump station with clean drinking water provided for free by a little city near where we camp in the woods (Idaho City, Idaho), so we started filling up there to save hauling the extra weight of water. 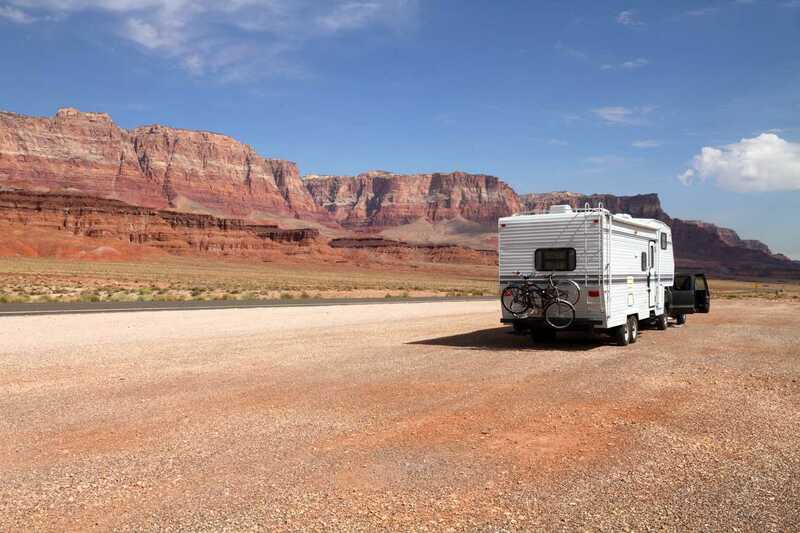 As you pack, remember that heavy items like suitcases and a generator should be low and toward the front of the RV. Another tip for weight is to check to see if you will have water where you’ll be camping. First, check how much your vehicle can tow. Usually you can find this on a sticker in the driver’s door jam. My 2011 Ford F-150 can tow 11,500 pounds. Before this truck, we had a 2012 Dodge Durango that could tow 7,200 pounds. Now check the trailer. The trailer will give you a few different numbers: (1) Dry weight (weight of just the RV with no water or gear in it), (2) GVWR (weight with it full of gear and water), and tongue weight (weight applied by the trailer pushing down on the hitch of the vehicle). You need to make sure none of those numbers exceed what your truck can tow. I recommend that you give yourself a buffer of NO LESS than 1,000 pounds between what you’re actually towing and what your vehicle says you can tow. Sometimes the vehicle manufacturers are extremely generous in their tow ratings, which means you can easily end up with a busted transmission or a burned out engine. Before you pick up your trailer, check the ball size on your hitch. Most travel trailers use a 2 5/16″ ball size. That’s larger than the ball size for most utility trailers or boats. As you begin to drive with your trailer, pay close attention to tight curves in mountain roads. Remember all those caution signs with an icon of a trailer tipping over? Those signs you’ve ignored your whole life? They’re extremely important when towing a trailer. 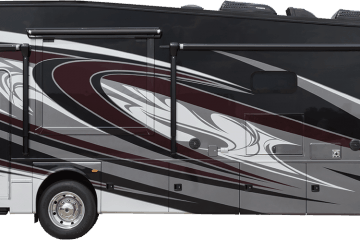 More than a handful of times I’ve seen RVs flipped on their sides on the road because they took corners too fast. 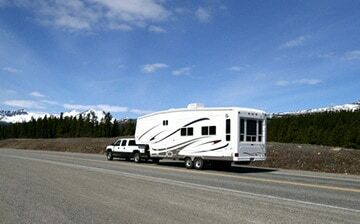 Fishtailing is a common problem with towing an RV. There are a number of ways to address it, like adding a sway bar or weight distributing hitch, or installing suspension airbags on your vehicle. If you have a lightweight trailer (under 5,000 pounds) and a heavy tow vehicle, I actually recommend going without a sway bar at first and seeing how things go. On my vehicle, I don’t really have issues with sway even without a sway bar. If you notice the tow vehicle beginning to fish tail, don’t turn the wheel, don’t hit the brakes. Just let your foot off the gas and drive straight. If you have brakes on your trailer, you can lightly tap the trailer brakes remotely from your truck. 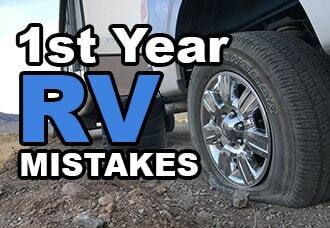 I recently wrote an article on this site called “The 27 RV mistakes I made in my first year with a camper trailer“. In it, I mentioned the trouble with travel trailers and tree-lined streets. I live in a neighborhood with mature trees lining the streets. It’s beautiful, but a nightmare for travel trailer owners. I once pulled up alongside the curb in front of my house to load the trailer and BOOM! The trailer contacted a branch that was hanging lower than I’d thought. It caused some damage. The chain saw went to town on that tree branch later that day! Be careful to watch for obstructions from trees. Also, be careful as you’re in the mountains that you don’t go down a steep decline. The tongue of the trailer is likely to hit the ground on a little depression, which will likely bend your stabilizers (speaking from experience). You have to park your travel trailer on flat ground. There are several reasons: (1) It can actually damage your RV’s fridge if you use it while parked on an incline or decline, but only a significant slope. Also, it will feel weird in the trailer when things aren’t level, and the RV will bounce around more as you walk. Next, unhook the tow vehicle. Personally, I think it’s a lot easier to set up the trailer when it’s not hooked up to the vehicle because all the stabilizers will hit the ground and you won’t have to match them to the height of the hitch. Also, your tow vehicle is now free for driving kids to the lake or exploring the town. Then, you need to put the stabilizers up. There are usually four of them. The stabilizers keep the trailer from bouncing whenever someone walks in the trailer. Unless you want the whole trailer shaking when your kid turns over in bed on the other side of the trailer, be sure to do the stabilizers. 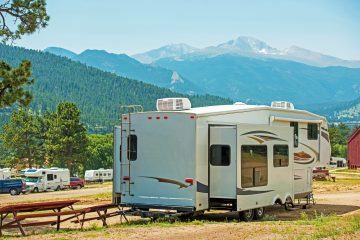 If you’re at an RV park or somewhere that you’ll have power, you have to make sure you have the correct electric adapter for the job. Most travel trailers have 30 amp service, but some trailers have 50 or 15 amp service. Each one has a different connector. Without the right adapter, you can’t hook up to the RV park’s power. You can also get an adapter to run your trailer off a regular house outlet, but it’ll likely blow a fuse in the house if you try to run your air conditioner. I absolutely LOVE my generator. For a portable, it’s perfect, but sometimes I think I’d pick an RV with an onboard generator for my next RV upgrade. The power system in an RV took me several trips to fully figure out. There are some not-so-obvious things to learn in this section, so don’t skip it. First of all, the battery in your travel trailer will not power your air conditioner. You have to be plugged in to a powerful 3,000 watt generator (or more) to power your air conditioner (if you’re buying a generator, I highly recommend the Champion 75537i one because it has a remote start. Click here to see my review). When the air conditioner is running, you may find that you can’t do more than turn on the tv and one or two lights before it’s sucking too much power for your generator. Running the microwave at the same time as the air conditioner would require a VERY large generator. Of course, all of this is a moot point if you are plugged into power at an RV park. In that case you can run everything in your trailer without worry. When you set up your generator, I recommend taking it out as far away from the trailer as possible to keep things quiet. Some generators run nice and quiet so it can be peaceful in your trailer, like the Champion that I recommend in the link above. Others can be so noisy that it makes camping no fun at all. 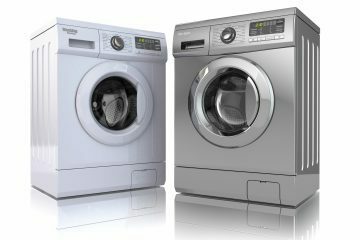 The microwave, the air conditioner, and many of your regular power outlets will only work when you’re plugged into power or plugged into a running generator. However, the rest of your trailer can run off the batteries. The lights in your trailer, the fans for the heater, the slide, powered jacks, the ceiling vents, and anything else will work on battery power; however, you may find that the batteries don’t last nearly as long as you’d expect. We have two batteries on our trailer, and we can only run our heater for about 3 hours before we need to turn on the generator again to charge up the batteries. It takes about an hour to charge our batteries. The fridge in most RVs can be run either on propane or electricity. Usually I run mine on propane while I’m on the road, but if I plug into electricity at an RV park, then I’ll switch to electric. Mine also has an “auto” setting which will choose the appropriate setting automatically depending on if there is power plugged in. 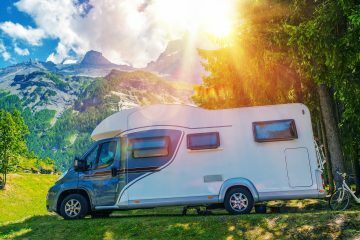 Some motorhomes and fifth wheels recently have been manufactured with “residential fridges.” While they are larger and more luxurious, it’s very limiting to not be able to run it off propane. Another strange thing is that most travel trailers only hook a few lights to a switch. Most of them have a button on each light to turn them on. This is a bit annoying when you’re trying to turn on all the lights at night, but helps to conserve power. 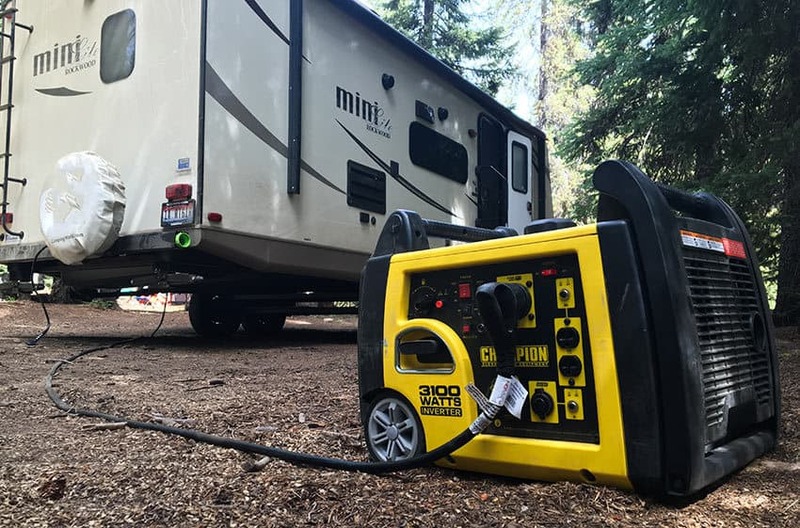 If you are planning to boondock on your trip by using a portable generator instead of camping at an RV park where you can plug into power, you should know that most generators of about 3,000 watts will take 1.5 gallons of gas to give you 4 hours of power. Be sure to bring along plenty of extra gasoline. RVs have three tanks for liquids: the fresh water tank, the gray water tank, and the black tank. The fresh tank stores fresh water that you put in with a hose from your house before you leave. The gray tank is where the water from the shower and kitchen sink goes to be stored until you dump. The black water tank is where the toilet deposits go. Trailers come with a variety of different water capacity tanks. Even though my trailer has a relatively large 43 gallon fresh water tank. With me, my wife, and our three little kids, that’s plenty of water to cook with, use the restroom, and drink from for 4 days. However, it’s not enough to shower with for those four days. We can really only last 2.5 days if me and my wife take short showers one morning. The water in a new trailer can have a tendency to taste a little plasticy until you run water through it a few times, but it’s okay. After a trailer has been winterized, you have to run TONS AND TONS of water through the system to get all the antifreeze out of the lines. Still, it can have a lingering weird taste. We usually bring bottled water to drink. I recommend getting hand sanitizer for your RV to reduce how much water you use. Also, which brushing teeth, turn off the sink while brushing. 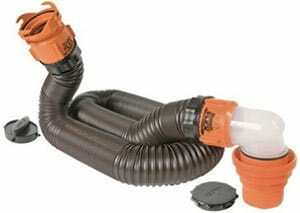 You’ll need an RV dump hose to get the dirty water out of your black and gray tanks. Click the photo to see the one I recommend on Amazon.com. Finding an RV dump station can be a bit of a trick. There are likely many of them in your town, but you have to search a bit to find them sometimes. I usually just google rv dump stations until I find stations nearby and learn where they all are. Some municipalities have free dump stations near the wastewater processing plant. Most gas stations charge $5 or $10 to use theirs. When you get to the dump station, first you have to park ahead of the dump hole so the back of the trailer on the correct side is near the dump hole. Your RV needs a dump hose, and they usually don’t come with one when you buy one new. Your job will be MUCH EASIER and less messy if you buy a nice 15′ one with good connections like this one on Amazon.com (Aff. link). The advantage of this one is that it has a clear connector so you can see when it’s done emptying. I admit that I’ve made the mistake of pulling out the hose too early and…. ugh…. Anyway, once you connect the hose to your RV (the connectors are standard between all brands), you put the other end in the dump hole. Then you go to your black tank and open it up by pulling the large black lever under your RV. All that nastiness will run through the hose and into the hole. Once it’s COMPLETELY finished (remember the “ugh”?) you next dump your gray tank by pulling the gray lever. Once that’s done, you take the hose out, wash it with the hose at the RV dump station, and put it back in the bumper of your RV (that’s typically where they are stored). Your fresh water has a little white spigot valve that you pull to empty the water. Just twist it so it slowly dumps as you’re driving down the road on the way home. It’ll likely take an hour if you have a lot of water in there, and the fresh water won’t hurt anything to leave on the road as you drive. When you get home, LEAVE THE RV PACKED! I like buying extras of all the cooking and other supplies to leave in the RV. This makes it MUCH more fun to get home and just walk inside and be done. No need to go through two hours of cleanup. Just bring in your dirty clothes and perishable food and you’re ready to watch some Saturday night college football. Hope you found this post helpful. 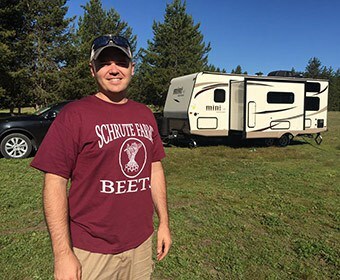 If you did, you’ll also like my post on 15 things I had to buy after getting a new camper. Thank you ! Really reinforced what my hubby said. But, I need to know too! I agree that you need to find out how much your vehicle can tow before you get a travel trailer. It would make sense to find something that is haulable by your car as well. My sister is looking for a camping trailer, so she’ll have to make sure it’s not too heavy for her car. What about using full-service sites. Should you leave the drain open on your tanks to drain instantly or accumulate to help break down waste so solids don’t collect in the bottom of the tank. Its best NOT to leave your BLACK tank open even when hooked up at a full service site. The tank needs the water to break down solids and additionally uses the water to flush the BLACK tank when you open it. The GRAY tank is mixed emotions for many campers. Many folks do NOT leave the GRAY tank open in fear of sewer gasses coming back into the camper. But your drains all have traps which contain water and will stop the gasses from returning. Additionally there are vents to your roof to allow the gasses to escape. I personally think leaving the GRAY tank open is NOT a good idea and only takes a minute to drain. Watch your levels and drain accordingly. My wife and I are thinking about getting a trailer to take camping but we aren’t sure it would benefit us. I never considered that you can just leave your camping equipment in the trailer between trips. This would be a great way to save ourselves the trouble of having to pack for each trip. Thanks for sharing! My husband has been trying to talk me into buying an RV. It seems like a nice idea since we do like travel and camp a lot. However, I still wasn’t sold on the idea. I’m more open to it, especially after reading how you don’t have to worry about packing and unpacking camping gear. That’s so time-consuming, so I’d really appreciate that benefit. I am getting ready to look for a light weight camper to pull with my SUV. 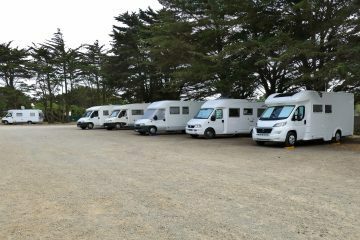 I have an appointment in a couple of days with the Camper World in my area. I would like to hear more about your buying experience with them since I it was not a good one. Thank you! My husband and I have been excited about getting an RV. I appreciate your advice to make sure that we just buy things that we’ll need for camping and keep them in the RV, rather than keeping them in the house and bringing them out every time that we want to go camping. This makes so much sense and will make leaving for a camping trip so much easier! Don?t buy at Camping World, any place but there. They are crooks and add on extra costs on the end. I couldn’t agree more. While I did go back and get the Good Sam card and use some of their services, I was all set to buy my travel trailer there, agreed on a price. Then they sat down and had added 2000 dollars in dealer prep fees. I went about 10 miles down the road and was treated much better. That is an awesome article. Thanks for the camping tips ahead of my tour. Keep sharing! Absolutely! I have a close friend who is currently living in a camper and has been for several months, even throughout the winter. In fact, we just posted a new article about how to stay comfortable in a camper in winter weather. You should read it! Wow! Such an informative article. Thanks for sharing this. Great article! I am learning about RV’s. My husband and I had a Winnebago for years but he is gone. Thanks for all the info! Thank you for this article! My husband and I just bought a Adirondack 2007, and we are redoing the floor and fixing a few things. We already have our campsite booked for October and next Summer! Great family time to be had. My grandparents were snowbirds when I grew up, so RV living was always fun to me! Thanks for all the pointers! I like the tip you gave to get sanitizer for your RV to help you save water. I am going on a camping trip with my wife and kids in a few weeks, and we want to use a camping trailer. I will be sure to get sanitizer before we go on our trip. I’m getting my very first RVS this fall, and your guide has really helped me understand them better and how to take care of them. Not overloading the trailer is definitely a good tip, especially for someone like me who never packs light. Using a label maker to mark what goes where is a great way to moderate that, and I’ll definitely try that out. I just bought a travel trailer in August. We took it on a short trip to some friends place 3 hours north of us. We went up on Saturday and came back on Sunday. We didn’t use the toilet, shower, sink, microwave, stove or oven. We basically wanted to just get a feel for how it would pull going up the mountains. I did get a sway bar hitch put on and it was well worth the extra $900.00 for the peace of mind. We hit some wind coming back home and the trailer never moved and follows right behind the truck. I have company coming in a month from out of town and they will be staying in it for a month while they are here. We have booked a campsite for the end of July next year near Yellowstone and will use is frequently to escape our Arizona summer heat. Once we retire we plan to travel the United States for weeks at a time. I can’t wait. I bought my trailer at La Mesa RV in Mesa AZ, I believe we got a good deal and had no issues. The trailer is back there right now to get some things fixed that we detected at our walk through and after our first trip so I will post my experience with the service department once we get it back. I am so excited to take more camping trips, but our schedule won’t allow it for a few months at least. Hi, this article really helpful for me. I am confused about choosing the right camping guide what would be the best for everything. But review this article my confusion is clear, Thanks. Where is a good place to buy a camper? Do not leave any food stored in your camper while not in use. Mice will chew through everything, even the water lines during dry spells. Very expensive fix. I am so grateful I found your post, You’ve really covered up almost all the possible tips that a beginner should follow when planning a camping. My husband and I have been thinking of going on camping soon. Actually, I got a lot of information from your blog which can make our camping much more relaxing and enjoyable. Thanks. These are great tips for beginners, glad to find this article. Great article! Thank you so much for sharing your experience! I can totally relate I decided it was time to get over my fear of trailer camping just this year. I did it in a bit of a backward way: I booked a backpacking trip for the end of this year. I figure there’s no better way for me to prepare for such a big adventure than to start trailer camping, It was so great that I have two more planned and a few more in mind. Your tips make sense and you’re right that it’s very empowering to face our fears and take control of them. Yay for us!!! Hey I bought a new trailer and wonder if there’s any websites that you can buy a spot for few day for travel trailer . Thanks. Very informative. I’ve been checking websites for advice and info. I’m still in the planning stages. I still haven’t decide between a travel trailer and a class C.
Nice article, thanks for all the tips! The hitch ball size should read “2 5/16 inch” for most trailers over 5000 lbs — but again, it’s important to check the specs of your specific trailer. This article has been a big help for me. Thanks I was able to read this one.